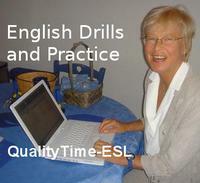 Here are additional exercises on the use of simple defective verbs, also called modals. Defective verbs are not easy, so they must be studied seriously. It is often a good idea to verify the exact translations in your native language. QualityTime-ESL 17 "Simple Defectives Part 2"